Yes, this one is definitely my last post before I fly to France next week. I was going through one of my books called “La cuisine de Bistrot” from Tomawalk Editions, yesterday and this recipe really caught my eye. This is such a simple and yet delightful little dessert. 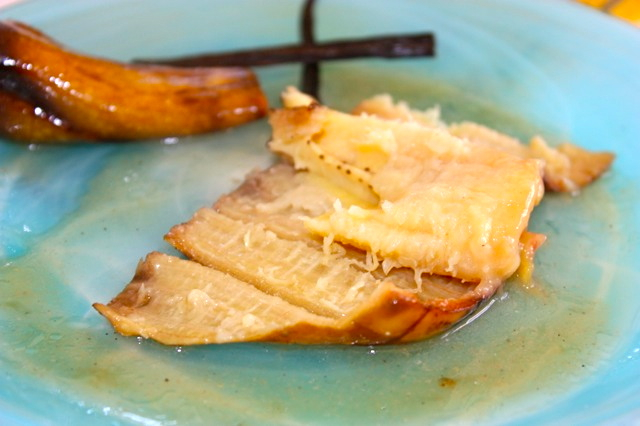 For me, nothing beats fruit based desserts and this warm and soft banana swimming in rum and brown sugar is a winner, besides it’s very simple and quick. These days, I have very little time to cook for myself, I am too busy cooking for others, so something so simple and delicious is a big winner in my book. 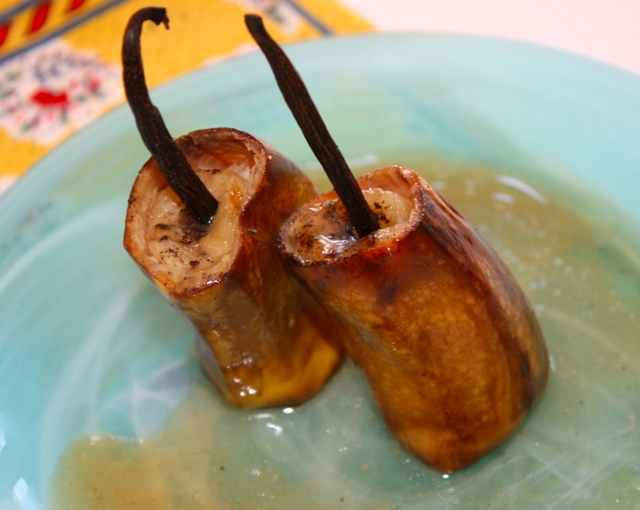 If you have guests, and have no idea what to make for dessert, try theses bananas, they will certainly make a “bel effet” (a great impression, I hope this is proper English). Papillote always make great presentations…opening them is like opening a surprise, you never know what you are getting inside. You can use parchment paper (that’s what I use most), but today I was out so, I had to use aluminum paper even though there has been some warning about the use of aluminum. It’s bad if it gets into your system at some small doses, but I figured I will not die if I use it once. Cut the vanilla bean lengthwise and scrape the beans with a knife. 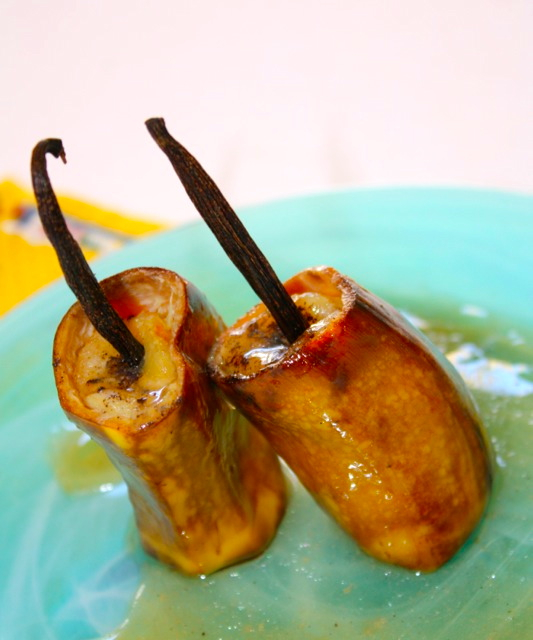 Insert them on sides of the banana between the peel and the flesh. 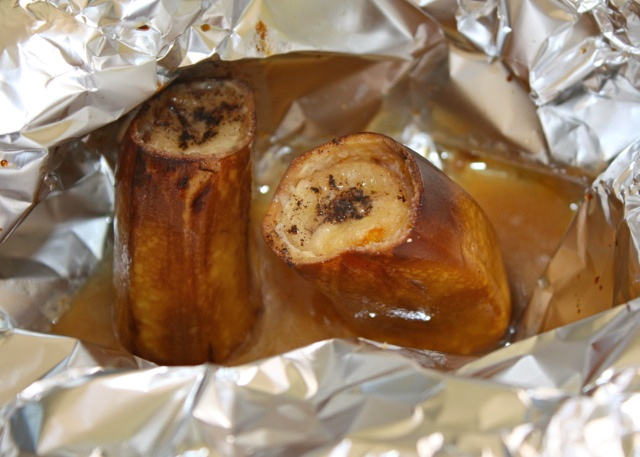 Using a parchment paper place banana trunks in the middle of the foil of paper, top with sugar and butter cut in pieces. Close the papillote and cook in a pre-heated over at 370F for about 20 minutes. Open the papillote and add rum. Serve in plates, pouring the juice on top of bananas. This entry was posted by silvia on June 1, 2012 at 5:06 am, and is filed under Desserts. Follow any responses to this post through RSS 2.0.You can leave a response or trackback from your own site. I like fruit-based desserts as well. And this one looks really lovely! The baking must really intensify the flavor and sweetness of the banana.